Coverage of northern Tunisia (plus a few scattered sheets of other major towns) in 94 sheets; average of two versions of each. 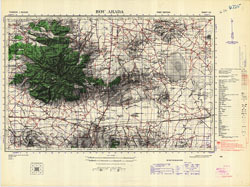 Based on French maps dated 1907 to 1942. See OR 5619 for index. Total includes small number of AMS reprints dated 1943 and several sheets printed by 518 (or 516) Corps Fd Svy Coy RE (printed on both sides). Sheets printed by Litho Sect MMP&P Coy. att. 46 Survey Coy SAE are filed separately as WDR 602. Sheets printed by 512 Fd Svy Coy RE (Middle East Command) filed as MDR 602.